Start by calculating three “L” shaped connected numbers whose sum equals the target number. Eliminate all correct equations until you uncover the hidden number that DOES NOT work in any equation - no matter what arithmetic you use. Eliminate all correct equations until you uncover the hidden number that DOES NOT work in any equation - no matter what arithmetic you use. 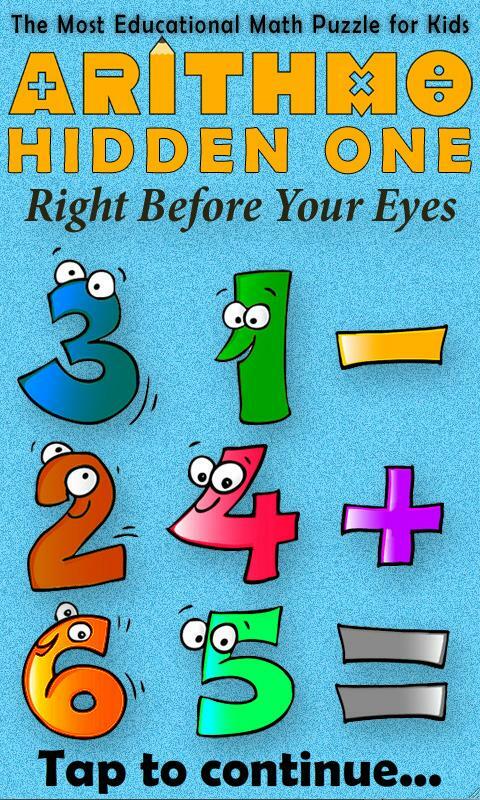 Hidden One For Kids is so easy, yet it builds math, logic and reasoning skills by testing your child’s ability to perform simple math operations. Not only will your child get smarter, but so will you! Whether on long car trips, waiting for food at a restaurant, or during one-on-one time, Hidden One for Kids will help you bond with your child and keep you both entertained for hours, days and years to come! So parents if you want your child be the best he or she can be academically, then go ahead and download all of our math puzzle games and teach your kids reasoning, recognizing, ARITHMO! Thrillz and skillz! You’ve just discovered THE BEST children’s math games anywhere! Arithmo ™ is the extremely popular series of math number puzzles from Zoki Games™, a leader in educational games that develop brain function and sharpen minds. All of our games and puzzles are designed with all skill levels in mind and have a variety of shapes and difficulty levels to entertain and brain-train your child for years to come. When your child enters the world of Arithmo he or she will be challenged to think differently. You’ve just discovered the best math game , logic game, and number puzzle on Android! Hidden One is only one of a dozen Arithmo puzzle teasers available for download. So if you want a real challenge that builds math skills, logical deduction and reasoning, go ahead and download all the Arithmo games.Amazing Android Apps for Dummies! This fun puzzle game is one of the top apps and best games. It's a family app that consists of logic games, picture puzzles, brain exercises, education games, intelligence games, and brain training games. It's one of the most addictive games ever because of its hard puzzles and cool games. We have these puzzle games in book form available in the following countries: Australia, Canada, UK, Denmark, England, Finland, France, Germany, Deutschland, Greece, Iceland, Ireland, Italia, ,Netherlands, Norway, Portugal, Spain, España, Sweden, Suisse and United Kingdom. Tired of Angry Birds & Bubble Buster check out www.zoki.com our games: Chess Free, Checkers Free,Backgammon Free, Dominoes Free, Hearts Free, Spades, Gin Rummy, Reversi, Go and other classic board, puzzle, card and brain games. Play this game to increase score and confidence on standardized tests such as the SAT, PSAT, GRE, GMAT, ACT, Kumon, Kumon, MCAT. This is not math homework - this is math playtime! Keep your brain bright can be fun. Try: IQ test,Tetris, Unblock Me, Words with Friends, Brain Age, Test, Memory Trainer, Move Block, Simon, Bubble Buster. These games help develop memory, attention, focus, and more.